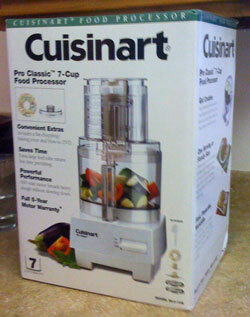 Evan bought me a Cuisinart for my birthday. I’d long been talking about how one would help me out in the kitchen, and I had some tasks taken care of by getting an immersion blender which had some other attachments I could use for some light chopping, but I had no idea the extent of the little machine’s power. Reading through the manual, I learned that it was great for making bread — something I’d been meaning to try for a while, but hadn’t done yet. And as things turned out, for my first two loaves of bread, I didn’t even use the Cuisinart — I used a no-knead recipe from the New York Times on YouTube. The recipe is dead simple, as explained in the 5-minute video below, and it turned out pretty well. 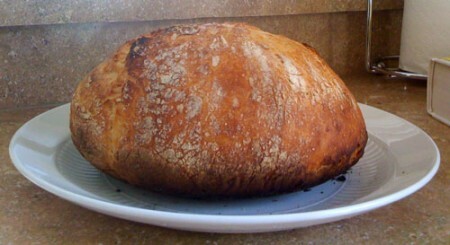 My first try, the bread got a little burnt on the bottom — I had it on an oven rack that was too low. It also stuck to the cloth I was turning it out on, though that didn’t affect the final appearance much. It was also more dense than I would have liked, but I felt it was good for a first effort, and I did eat everything except for the bottom crust. My second loaf didn’t burn at all and looked even prettier, but it still wasn’t as airy as I would have liked — maybe I need to add a bit more yeast or let it rise for a little longer. 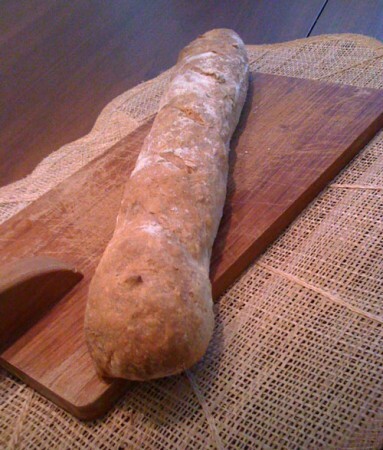 My biggest bread success yet, though was making baguette’s. 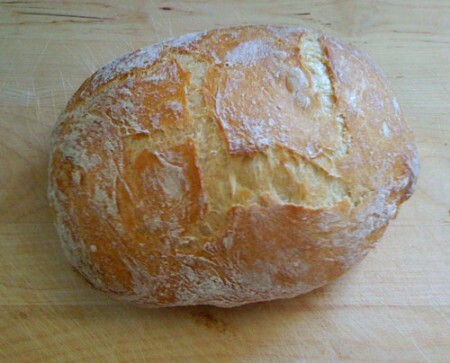 I once again turned to Mark Bittman’s How to Cook Everything and used the very first recipe in the bread section. I used the Cuisinart to knead the dough, then spent most of the day just letting it rise, occasionally separating it or rolling it into long snakes. I ended up with four baguettes, which were crusty on the outside and soft and delicious on the inside. Unfortunately, we should have eaten them all immediately, because the next day, they were not nearly as good. The recipe couldn’t have been simpler, again using only flour, water, yeast and salt, and even though I think I overcooked them by about 5 minutes (they were a bit darker than expected), they tasted just perfect. My other flour-and-water baking obsession has been making crackers. I love crackers and generally will devour and entire box myself in a single sitting. I’ve made crackers twice before, again from How to Cook Everything, and they’re incredibly easy. All you need to do is mix together a cup of flour, a tablespoon of butter, a tablespoon of salt and about a quarter of a cup of water, then roll the dough out into a thin sheet and bake. You can also sprinkle on salt, sesame seeds or other toppings, and the whole process takes about 15 or 20 minutes. I’ve made two batches so far, and I’m partial to the ones I made with half all purpose flour and half wheat flour since they were a nice brown color. I then topped some with sesame seeds, others with salt and pepper, and others with garlic salt, and I cut them into strips before baking so they’d be relatively uniform. I haven’t taken any photos yet, but I think I’ll be making crackers a lot more in the near future. Thankfully they keep well for at least a few days.